If your skin feels dry or your complexion has dulled, come to Hand & Stone and ask for a facial. Our location in Bradenton, FL mainly services Sarasota and welcomes walk-in clients, so you don't even need a prior appointment to enjoy our professional services. From teenagers to adults, guests of all ages can take advantage of our excellent skin treatments. We operate locally, so our services are convenient and readily available to residents of our community. Whether you want one of our signature facials or an enhanced option, you can look forward to receiving a luxurious treatment in a relaxing spa atmosphere. Our skin treatments can clean out pores, lock in moisture, and brighten your complexion. No matter your skin type, we can offer a wide variety of affordable facials to meet your needs. 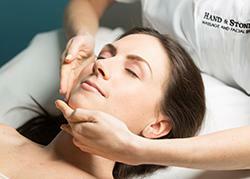 Hand & Stone offers high-quality facials, exfoliation, and peels to clients throughout University Park. We're open every day of the week, and membership programs are available to make it easier for you to experience our services as often as possible. To look and feel your best affordably, call us today.